It has been awhile since I've updated the latest in our life. I just returned from a fun-filled weekend with two of my most dearest friends. We had a fabulous time talking, eating, and spoiling ourselves. Laura started ballet a few weeks ago. Three of her little friends are in that class, so it is adorable to watch all of them attempt to be graceful. 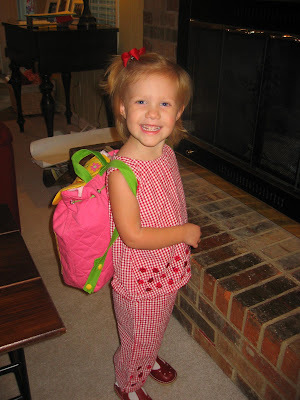 Laura started Pre-School last Thursday. She did great! I was so proud of my big girl. I love that she enjoys school so much; it makes my working those days so much better. Finally, today was a big day for us. We got to have our 10 1/2 week ultrasound. The baby was moving so much. It is amazing to see those little hands and feet kicking. All looks wonderful, so I am officially graduated from my specialist to my OB/GYN. Our first appt. with her is next Thursday. First, congrats on the baby! I can't wait to meet her (that's right her! 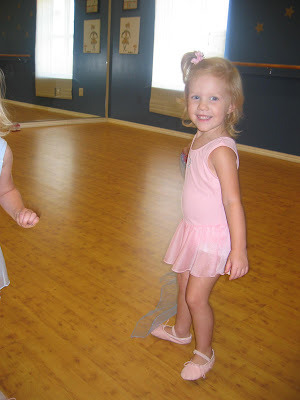 you make beautiful girls so I think you should have more) Second, Lolo is the cutest ballerina ever! Never throw away those shoes. Third, for a child that has two parents who will forever be involved in education, I'm glad she enjoys school. Awesome you enjoyed your girls weekend. I GREATLY wish you all were going to be in StL this weekend with me. Thanks for your messages of love and support. Oh my she is such a big girl now!!! I decided to keep Anna's first pair of Ballet shoes - they are so little and cute! Love the ballerina picture! So cute. Glad you had a great weekend. And I'm so happy things are going smoothly with the baby. What a cute ballerina! I LOVED ballet when I was little and continuted taking classes until high school. I hope Nora will develop a love. She is so big! I can't believe it. Just think how big she will look once that baby gets here. I am so glad you are feeling well and the baby is moving around.